New Hampshire House at work on Thursday. 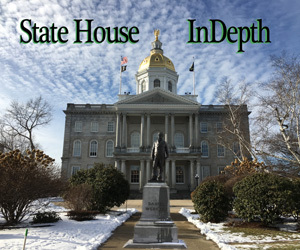 CONCORD — Marijuana users convicted before the state decriminalized simple possession would be able to have their record annulled under a bill the House approved Thursday. The House also defeated a bill that would have repealed the law establishing buffer zones around abortion clinics and a bill that would have given lawmakers the ability to set turnpike toll rates instead of the Executive Council. Last year lawmakers decided possessing three-quarters of an ounce of marijuana or less would no longer be a crime in New Hampshire and instead would be a violation much like a parking ticket. House Bill 399 establishes a route for those convicted or arrested before the law changed to annul their record. After a lengthy debate, the House voted 228-141 to kill House Bill 124, which would have repealed the state law allowing a 25-foot buffer zone around women’s health clinics that preform abortions. Supporters of the bill said there have not been issues in New Hampshire that would require such a buffer zone, but opponents disagreed. Bill sponsor Rep. Walter Stapleton, R-Claremont, said the law is not needed and added he has handed out anti-abortion leaflets at abortion clinics for 12 years, noting he was always peaceful. 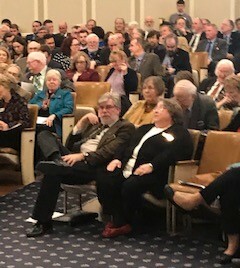 But others disagreed including Rep. Debra Altschiller, D-Stratham, who discussed the history of bombings, arson, assassination and other threats against abortion clinics around the country. The summer after Granite State lawmakers approved the buffer zone bill, the U.S. Supreme Court ruled a similar Massachusetts law unconstitutional. Supporters say the New Hampshire law addresses the issues raised by the ruling, but the law has never been enforced. Clinics in Manchester, Concord and Greenland often have protesters outside their facilities. Supporters say the 2014 law protects patient safety and privacy at reproductive health centers in the Granite State by allowing health centers to establish patient safety zones of up to 25 feet around the facility. “By rejecting HB124 today, the New Hampshire House has reaffirmed that it prioritizes patient privacy and the right to make one’s own personal health-care decisions without fear of harassment or intimidation,” said Kayla Montgomery, Director of Advocacy and Organizing for Planned Parenthood of Northern New England. “We’re excited to see the new legislature begin the biennium by taking a strong stance in support of patient privacy, and we look forward to working with them to continue our state’s longstanding bipartisan commitment to protecting and expanding access to reproductive health care.” Since the law passed, there have been several attempts to repeal the legislation, but all have failed. With no debate, House members voted down House Bill 248, which would have lawmakers decide on turnpike roll rates. The sponsors of the bill said the current method of having the Executive Council set the toll rates is unconstitutional because all taxes have to be determined by the Legislature. However, transportation officials say tolls are not taxes but user fees paid by those who use the turnpike system. They say motorists may decide not to use the turnpike if they do not want to pay the tolls. House Bill 349, which would allow state and county prisoners to seek a second medical opinion at their own expense on a 226-145 vote. House Bill 120, which would re-establish a licensure and inspection practice for tattoo parlors preforming tattooing, body piercing and branding on a 255-115 vote. House Bill 163 which would have added sexual reassignment to the definition of child abuse.